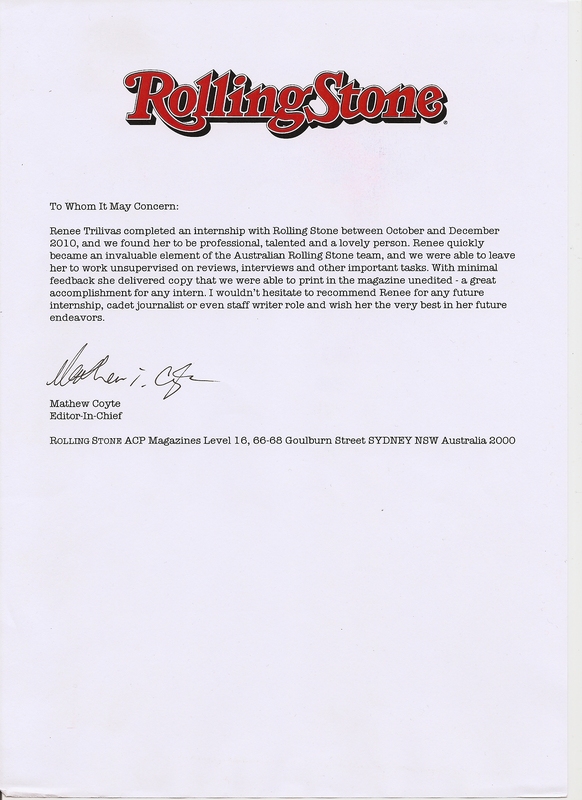 My work for my internship at Rolling Stone Australia. Here is a recommendation from Mathew Coyte, Editor in Chief of Rolling Stone Australia, endorsing my work as a journalist. I interned with the magazine October through December 2010. It was a phenomenal experience that has allowed me to grow immensely as a journalist and writer. Read my clips from Rolling Stone Australia here. There’s a fine line between bandmates and soulmates for the LA-based indie rock band Grouplove. This affable band is responsible for the beachy single “Colours” off their 2010 self-titled EP that caught enough global attention to snag the band a supporting spot next to musical forces like Florence and the Machine and The Joy Formidable. The group formed on a whim when painter Hannah Hooper “fell in love at first sight” with musician Christian Zucconi after his solo show in New York City; she texted the guitarist just days later with an invite to an artist’s residency in Crete for almost two months. The duo was both at a contingent position in their lives where they “had to decide if we wanted to give up being full-time artists and work permanently on a nine to five—so instead of figuring it out, we just went to Greece” where “there wasn’t much else to do other than create” vocalist Hooper laughs. “We both needed to get out of New York at that time and thank god we did,” Zucconi reflects. The quintet rounded out in the remote, mountainous town of Avdou the where Hooper and Zucconi met LA guitarist Andrew Wessen and his childhood friend, drummer and producer Ryan Rabin along with English guitarist Sean Gadd for their adult “summer camp” experience. All five members moved to Los Angeles to continue generating music once the program ended. “It was instinctual,” Zucconi says. The band has consummated their relationship with quirky bonding rituals like matching tattoos, a five-person tee-shirt with the phrase “Never trust a happy song” scrawled across the chest, and an online family photo album-style blog with everything from Hooper’s drawings to photos of the group’s collectively-owned dog and photos of Hooper giving her bandmates haircuts. Songwriting proved to be just as effortless as the band’s cohesion, with the band’s buzz-worthy first single, “Colours” Zucconi states: “I just kept singing that song and let my unconscious kind of flow out. The first or second time I played that for the guys they really liked the hook and they just built the song around the original riff that I had.” The band is largely inspired by their personal lives along with influences from the “big, kind of cliché bands” like Nirvana, The Pixies, Fugazi and Neil Young—“they inspire you to think it’s okay to scream and get these emotions out,” Zucconi says. “We’re too broken up to go on,” announces self-proclaimed Montreal chansonnier, European folk singer and synagogue canter hybrid, Leonard Cohen, with sticky tears clinging to his swollen eyes in Jerusalem, the final destination of his 1972 European tour. At the reflective age of 37, Cohen is usually the unwavering eye of the storm—either lulling hits like “Suzanne”, writing poetry while taking a bath or doodling hearts on a fan’s t-shirt amidst the backstage bedlam of flirty French groupies and combative German fans demanding a refund. This 106-minute documentary, directed and edited by Tony Palmer, is a snapshot of Cohen’s career and gripping, voyeuristic reality television before it existed. Six years after his solo debut, former shoegazing frontman for Slowdive, Neil Halstead, has finally released his second album Oh! Mighty Engine brimming with twilight acoustic pop. The album initially washes over you like a New York coffeehouse open mic singer with Halstead’s mumbling, breathy vocals frothing alongside rolling harmonies on tracks like “Sometimes the Wheels” that are too subtle to standout. But his blurriness is sharpened on tracks like numinous “Witless or Wise” and the coiling “Paint a Face”. The subtly scorching, folksy serenade “Little Twig” burns a place in your chest with endearing schoolboy lyrics like “I’m counting all the steps right back to you. Little twig, you are a fig”. Halstead also solidifies his beard’s status as a legend (seriously, it puts Zach Galifianakis to shame) on the album’s closing track “Baby, I Grew You a Beard” which, despite its effortless saccharine melodies, would probably freak even the most indie girl in Williamsburg. Oh! Mighty Engine has the potential to become the soundtrack to snoozy summer nights, waxing and waning between a swelling flame and the afterglow. If iconic Eighties director John Hughes were to rise from the grave and direct an indie love story set in an American high school—starring Zooey Deschanel as the popular, hair-flipping cheerleader and Jason Schwartzman as the pocket protector-toting computer geek—he would certainly ask London duo Summer Camp to provide the soundtrack. Indie singer/songwriter Jeremy Warmsley and Platform magazine editor Elizabeth Sankey’s collaboration Young is an imitation Eighties mix tape paying homage to Eighties anti-heroines like “Veronica Sawyer” from the 1989 cult classic Heathers and the untouchable heart-throb “Jake Ryan” from 1984’s Sixteen Candles. A few of the washy, seashore tracks like “Why Don’t You Stay” fade next to Warmsley’s Joy Division vocals and brilliantly cliché pop lyrics on the twitchy opener “Round the Moon”. Sankey’s angsty half-spoken, twee-pop vocals against Warmsley galloping guitar and pinging synths result in the best unpolished, 21st century, indie rom-com soundtrack—and perhaps the only one.